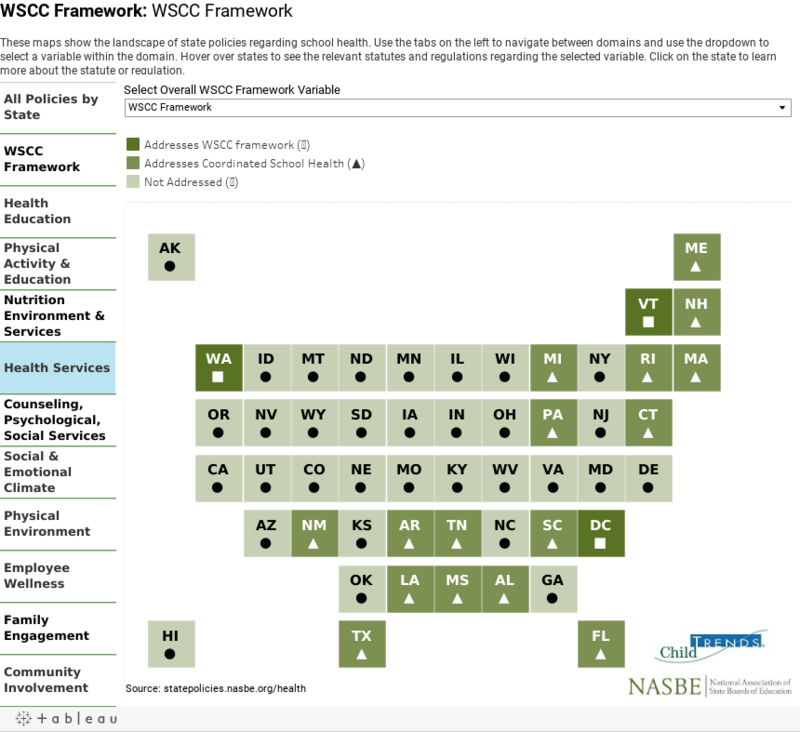 The NASBE State Policy Database on School Health aligns all existing state statutory and regulatory language on student health to the components of the Center for Disease Control and Prevention’s framework for school health promotion, known as the Whole School, Whole Community, Whole Child (WSCC) model. As part of the Robert Wood Johnson Foundation’s Together for Healthy and Successful Schools Initiative, NASBE partnered with Child Trends, the Institute for Health Research and Policy at the University of Illinois at Chicago and EMT Associates, Inc. to comprehensively document state education policies and analyze their alignment with the WSCC. The database encompasses policies enacted as of September 2017 for 136 variables across the 10 WSCC domains, as well as a category capturing references to the WSCC model itself. Further information on methodology, a summary of findings, and profiles for each state can be found on Child Trends’s website. Use the visualization below to see the state landscape of school health policy, and browse by state or category or perform an advanced search to find specific policies.